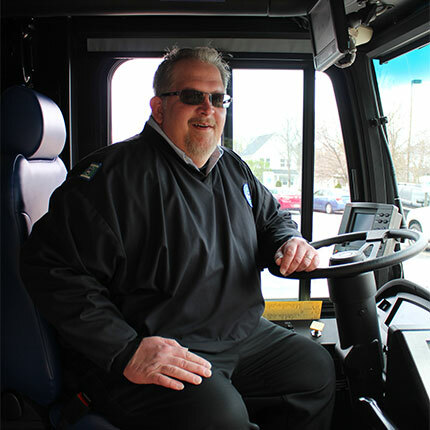 Matt Kallas is a soft spoken veteran MCTS driver who lets his kind actions and customer service approach do all the talking. His actions on March 20, 2017, are getting statewide praise and attention. Kallas was driving home after a late shift on March 20th when he spotted a car that matched the description of a missing elderly man. Matt pulled alongside the car and eventually convinced the man to turn the car off. Matt also contacted police. Matt’s actions helped get the missing man home safely. Milwaukee County Executive Chris Abele and Wisconsin Attorney General Brad Schimel held a news conference to publicly thank Matt for his alert and kind deed. “Thank you, Matt, and thank you to all the people across Wisconsin who help us close Silver Alert cases all the time. The Silver Alert program has been critical in recent years in keeping some of our most vulnerable citizens safe,” said Attorney General Schimel. The average age of someone missing when a Silver Alert is issued in Wisconsin is 78 years old. The program is responsible for the safe return of dozens of people in the past few years. While I was driving home tonight I had the opportunity to make a new friend, his name is Charles. Charles’s vehicle was listed on the Amber Sign as a Silver Alert. As I passed him on the Highway he was only going 50 mph & I recognized the vehicle type. I exited in an attempt to get behind him to verify the plate number. Coincidentally he exited with me. I waited for him to pass me & I pulled in behind him. I then dialed 911 & told the dispatcher I was following the vehicle described in the Silver Alert. Clearly he appeared to be lost. I was able to coax him into a parking lot & pulled alongside of him. I engaged Charles in conversation from my car. I asked him if it would be OK if I approached him & turn his vehicle off which he agreed. We talked for a minute or two before the Germantown Police arrived to further assist him. The dispatcher questioned if I was law enforcement, I said, "No sir, I drive a Transit Bus in the city of Milwaukee." See the thing is Charles will never know who I am or never remember me, he suffers from Dementia. (Dementia is a terrible disease that took my Mom) I felt that I was put there by GOD for a reason. To be able to assist this man in his time of need. After giving my information to the officers I drove away & began to cry. Knowing I did a good deed & only hoping someone would do it for one of my loved ones in a time of need. Prayers to you Charles & your loved ones. Matt’s example of MCTS Excellence received wide coverage. Watch the WTMJ 4 story below of check out the stories on FOX 6 and WISN 12.